These days I find it difficult to get 10 minutes to myself and I know a lot of my friends and even clients feel the same. It is extremely difficult to make time for yourself when life gets in the way. More often than not it is your training that gets put on the back burner and excuses such as “I’ll go tomorrow” or “I’ll do it later”start creeping in. I admit, Ive been there on more than one occasion too. So how can we fix this problem I hear you ask? 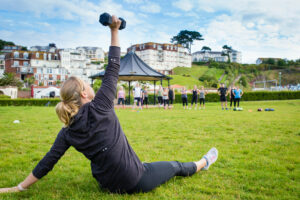 High intensity interval training is great for when you are short on time or cant make it to the gym, all it takes is just 20-30 minutes and then you can carry on with the rest of your day. The best thing is that you hardly need any equipment and the amount of exercises/workouts you can do with your bodyweight alone are endless. You also effectively get ‘more bang for your buck’, you train for shorter periods of time and can get greater results. For example, doing 20-30 mins steady cardio is great, it will help with weight loss and theres always a place for it within your training plan. However if you’re looking to get that heart rate pumping, metabolic rate spiking, get fit and burn those calories, high intensity workouts are what you need. So here is a quick HIIT workout I put together that you can do at home, you could even get the children involved as chief time keepers or get them working out too. This is a EMOM workout, meaning every minute on the minute. Start your clock and complete each exercise every time the minute starts. Each exercise is completed within a 60s period, if you finish your exercise within that time frame you get to recover for the rest of the minute. e.g. If it takes you 30s to do 15 V-sits then you have 30s recovery before doing your press ups and mountain climbers. You can then train for as long as you have, whether it is 20 minutes or 36 minutes, its up to you.